The streets are lined with stout glass towers, perfect palm trees planted in perfect rows, private boat slips, golf courses, jogging paths, faux-Mediterranean townhomes, and all the usual emblems of an upscale, South Florida suburban community. This is Aventura, an unmistakably American version of paradise where stray foliage doesn’t stand a chance, zoning codes seem like scripture, and residential enclaves boast more security than a South American drug ranch. As one of Miami-Dade County’s youngest and most successful municipalities, Aventura has been featured in international magazines, hosted presidential candidates, courted celebrities, and is regularly touted as the City of Excellence. Such cachet did not grow spontaneously. Aventura’s image of luxury and prestige has been skillfully crafted and professionally marketed since before the city even had a charter of its own. However, some say the Aventura brand has been so heavily promoted and protected over the years — by developer-backed marketers and image-conscious government administrators — that troublesome civic issues are often whitewashed, critics sidelined, and small-business owners left without a voice. “What is this place called Aventura? Who is Aventura? What are the businesses here? How many people do they employ? What’s the trending on commercial real estate? What’s the vacancy rate? How’s the city doing? How many condos are under water?” These are just some of the questions that real-estate franchise recruiter and self-proclaimed social entrepreneur Emil Hubschman wants answered. At age 75, the voluble Philadelphia transplant should be taking life easy, strolling the local golf courses or cruising the world. Instead he’s fighting to breathe new life into an organization he founded 14 years ago, the Aventura/Sunny Isles Beach Chamber of Commerce. Derailed by the sudden death of its CEO from cancer in 2002, and several subsequent years of neglect by interim managers, the chamber, once 450 members strong, has dwindled in size. Now Hubschman wants to get it back on course. And like any good chamber of commerce, he wants it to be the voice of small businesses in his area. The mall is so popular with tourists that foreign visitors comprise 20 percent of the traffic. In fact, 7 million more visitors arrived at the Aventura Mall than at Miami International Airport in 2009. Aventura Mall generates revenue greater than the GDP of many African nations, but is it really part of Aventura? Hubschman’s fight for the little guy is hard not to love, and his passion is endearing. Tall, lean, and exasperated, he cuts a distinct profile, like a harried college professor, or perhaps Ted Turner. When he speaks about small business, his thoughts seem to outpace his tongue, compelling him to stop now and then, reconsider, and begin anew. But with a touch of the firebrand about him, he has for many years, he admits, been viewed as something of a lightning rod in the community, operating in the shadow of Aventura’s bigger, more influential business organization, the Aventura Marketing Council (AMC). Created in 1988 by an elite group of businessmen and big-name developers — among them Turnberry Associates, the Trump Group, Mystic Pointe, Coscan, and Humana Hospital — the AMC’s original purpose was simple: promote the then-unincorporated corner of northeast Dade County as an upscale, business-friendly, resort-style community. 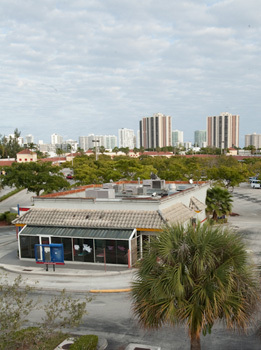 Forlorn strip malls, many with vacant buildings, line the city’s western edge, along Biscayne Boulevard. Rather than market their individual projects, developers realized it would be more effective to promote the area as a destination, to sell a lifestyle instead of a product. Brochures, a magazine, a local TV talk show, sponsorships, networking events, and other efforts helped them spread the word about their blossoming area. There were other reasons for forming the nonprofit, too, like lobbying the county for better services. With annual fees ranging from $475 to $16,000, most membership tiers in the AMC are reserved for those in the upper strata of the business world. A survey of the organization’s database shows 429 members. Excluding professionals like doctors and lawyers, roughly 30 percent of those could be characterized as small, independently owned businesses. The rest are mostly franchises, municipal governments, schools, developers, financial companies, or other corporate entities. What do those members get for their money? A seat on the AMC’s board for the highest-paying members, two monthly networking meetings, and coverage in the weekly Aventura News. Twenty years ago, according to the Miami Herald, the AMC “helped local community newspaper chain Miller Publishing/Community Newspapers found the Aventura News to publicize Marketing Council businesses.” Eight full pages, including the front cover, are paid for by the AMC and feature articles about the group and its members, mainly AMC meetings, ribbon-cutting ceremonies, and what appear to be news stories reporting on a specific member’s business activities. In 2001 the paper finally began identifying AMC-generated coverage, adding a small AMC logo to “purchased” pages. That logo, however, does not consistently appear near AMC stories, and some feel that the paper is misleading. Newspapers that sell their editorial space may irk journalists and raise questions of integrity, but critics say the AMC’s control of the News simply illustrates the way the organization has come to dominate the public dialogue in Aventura, and reveals the incestuous relationship between the AMC, big business, and government officials. For example, city Commissioner Bob Diamond writes a column for the News. 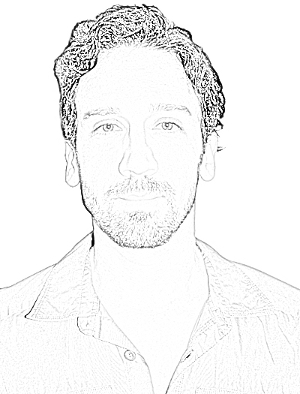 Dan Palmer, the paper’s editor, sits on the AMC’s board. Aventura city manager Eric Soroka also sits on the AMC’s board, as does city Commissioner Michael Stern, whose company operates the group’s website. Attorney and lobbyist Cliff Schulman, a regular face in the News, is chairman of the AMC’s board of directors. He also works for the law firm that acts as Aventura’s city attorney. In other words, he represents the business interests of the AMC’s members while his firm simultaneously advises the city on legal matters. Conflict of interest? Schulman says no, and defends his position by providing the BT with an e-mail from the executive director of the Miami-Dade County Commission on Ethics and Public Trust, which states, “I see no conflict of interest preventing Mr. Schulman, a shareholder with [law firm] Weiss Serota, from continuing to serve as chairman of the Aventura Marketing Council.” Schulman also points to legal documentation from the Florida Commission on Ethics backing up that position. Aventura City Hall, designed by Arquitectonica: An “institutional resistance to news coverage”? The AMC’s success at becoming an Aventura institution is largely attributed to the talents of its 21-year president, Elaine Adler. Formerly with the North Dade Chamber of Commerce, she is said to have risen from part-time secretary to chamber president, and increased that organization’s membership from a few dozen to a few hundred during her tenure. Recruited to the AMC based on that achievement, she led the group from obscurity to prosperity, and is praised by nearly all who speak of her — even AMC critics. 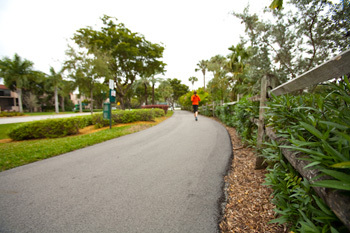 Among the city’s amenities is a jogging path circumnavigating the Turnberry Isle Country Club. Other locally distributed newspapers, including the Miami Herald, have limited resources for reporting on city affairs. There is, of course, Aventura Magazine, but it deals mostly with luxury living and doesn’t produce investigate pieces — not surprising given that it is co-owned by Aventura city Commissioner Michael Stern. The Shoppes at Waterways, on 207th Street, is one of the few commercial malls dominated by independently owned businesses. His company, Stern Bloom Media, for years has published the City of Aventura’s annual report, as well as a bi-annual guide to local businesses and events, which the city buys from him. To facilitate those transactions, his fellow commissioners have granted him a waiver from Miami-Dade County’s ethics code. Dense living in some 80 condo towers allows for the lowest property taxes in Miami-Dade County. To back up that claim, Lee produces a series of e-mails she wrote to various administrators showing the chain of contact. The mayor and commissioners’ phone numbers, meanwhile, are not listed on the city’s website, nor is there a listing for a city spokesperson or media liaison. The BT’s follow-up e-mail to a public-records request asking for additional information was ignored by the clerk, as was an e-mail to the city manager. Phone calls to the clerk went straight to voice mail. Another instance of apparent municipal self-consciousness involves prolific South Florida history-book author Seth Bramson. In 2009 he was commissioned to write a history of Aventura. Government administrators, deciding that they wanted to change much of the book’s content, put the project on hold for an indefinite period and the book, at this point, remains unpublished. Iron curtains and bureaucratic elusiveness prompt another question: Does anyone care? This past November, Aventura’s municipal elections were canceled because no one challenged the city’s incumbent mayor and three commissioners. All four were automatically reelected. In fact, only about half of Aventura’s estimated 30,000 residents are registered voters, and no more than about 16 percent of them regularly turn out to cast ballots in city elections. Taxes, in fact, were the main reason Aventura broke away from Miami-Dade County in the first place. Feeling as though they were putting a lot more money into the county pot than they were getting back in services, the well-to-do residents overwhelmingly voted to incorporate in 1995, giving themselves control of their own money and the ability to set their own property tax rate, known as millage. Today that rate is just 1.72, the lowest of any municipality in the county, meaning Aventurans are taxed $1.72 per $1000 of their homes’ assessed value. The City of Miami’s millage rate, by contrast, is 8.64. That bargain rate is made possible by some 80 condo towers, which allow a dense population of above-average earners to cram themselves into just 2.7 square miles. Taxes from the Aventura Mall and a few other large commercial properties grow the coffers, too. And of course the newly installed and highly contentious red-light cameras now contribute handsomely to the city’s funds, bringing in $3,053,000 during the last two fiscal years alone. It is within this complacent, vertical suburb that Emil Hubschman seeks to relaunch his chamber of commerce within the next 60 days, aiming to create a trusted gateway to the community (like a Better Business Bureau, only hyper local), with a welcome center, newsletter, updated website, and cell phone app. Homeowner and condo associations will get free memberships, he says, to help “close the loop” between locally owned businesses and residents. Word around town is that the Aventura mayor and city manager are open to working more closely with the chamber. “It’s a new day,” Hubschman beams. I can’t thank you enough for taking the time to beautifully write this well researched article.